Poets Notes: My husband and I visited Arlington Cemetery in Washington D.C. several years ago. We happened to witness a beautiful and moving funeral which has stayed with me. This poem sprang from that memory. 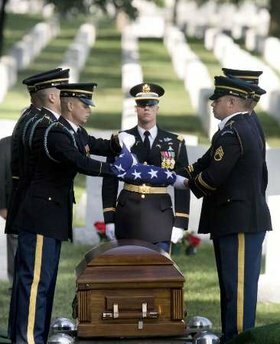 Editor’s Note: I have never been to Arlington but have had the honor of being part of my father's burial ceremony at Saratoga National Cemetery. Terri has certainly captured many of the feelings and images of such a funeral and of the rows and rows of honored dead.